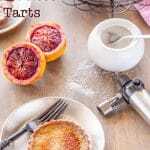 These blood orange creme brulee tarts are heaven in a tiny pastry shell! Packed with creamy custard, fresh citrus flavor, and topped with a caramelized sugar crust. Start by making the pastry. In the bowl of a food processor add the flour and sugar and process to combine. Add the orange zest and butter and pulse until the mixture resembles fine breadcrumbs. Add the egg yolk and water and process until the mixture starts to come together. Remove from the food processor and wrap in plastic wrap and refrigerate for 30 minutes. Preheat the oven to 355 degrees (180 Celsius) and lightly grease 8 10cm loose bottom mini tart tins. Roll out the pastry until roughly 5mm thick and then cut circles from the pastry that are 2 cm larger in diameter than the tart tin. Line the each tart tin and trim excess. Chill for 15 minutes before lining with baking paper and filling with pastry weights. Bake for 7 minutes before removing the weights and baking for a further 3 minutes or until dry and lightly golden. Set aside to cool. For the filling whisk together the eggs, caster sugar, orange zest and juice. Add the coconut milk and whisk until combined. Carefully divide the filling between the mini tarts and bake for 7 to 10 minutes or until the filling is just set. Set aside to cool. Just before serving sprinkle a little sugar over each tart and use a kitchen torch to melt the sugar to a light caramel. If you don't have coconut milk substitute with cream.